Is the CIA using ISIS in Marawi to topple Philippine President Rodrigo Duterte? The Philippine pivot away from the USA and toward Russia and China will not be tolerated under any circumstances by Deep State. The critical geostrategic location of the Philippines within the Asian side of the Pacific Rim is much to important for the Anglo-American Axis to lose. With this understanding, the MSM article posted below can be interpreted as a status report on the CIA-coordinated hostilities being conducted on the southern island of Mindanao. This very same strategy was utilized by the C.I.A. in Chechnya in an attempt to preoccupy Russia on their southern border with purposefully engineered ‘Islamic’ militarism. 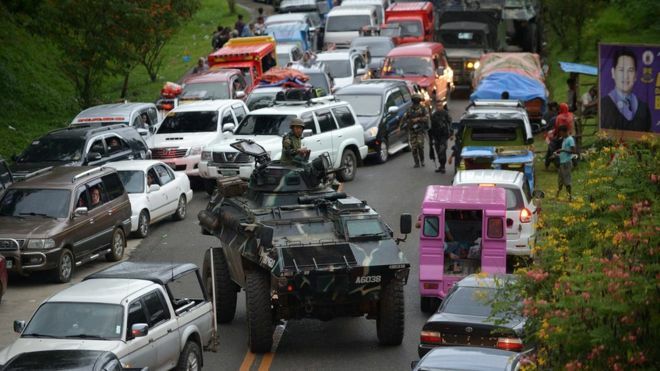 In the instant case, the city of Marawi is being used to stage state-sponsored terrorism (predominantly the U.S. government) as a launch-pad to conquer the rest of Mindanao. The very same strategy was used in Syria whereby ISIS and Al-Nusra were used by the C.I.A. to take over the outlying cities. The battle-hardened jihadis, who are often transported from other war zones throughout the world, are not really Muslims; rather, they are trained as professional terrorists in the ‘madrassas’ in Pakistan which are funded by Saudi Arabia. The Salafis of Wahhabism, which originated in Saudi Arabia as a violent splinter group of an ultra-fundamentalist Sunni sect, fanatically fight for ‘jihad’ for whoever pays them the most. This is why there are so many Wahhabi terrorist groups involved in the Syrian War; the mercenaries are always switching their allegiances to the highest paymaster. Just like the fake civil war in Syria, these Wahhabi fighters have been flown in, shipped in and bussed into the Philippines to man a U.S.-manufactured insurgency. In this way the C.I.A. will attempt to overthrow Duterte, just as they are trying to militarily remove Syrian President Bashar al-Assad. N.B. The following BBC report, like all “fake news” published by the Mainstream Media (MSM), ought to be read as an informal intelligence briefing. The C.I.A., MI6, DGSE, GID, and the MOSSAD frequently use various MSM outlets to disseminate crucial info to their agents on the ground and militants on the battlefield alike. 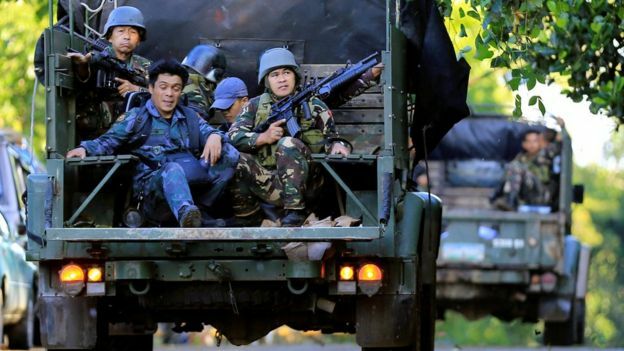 Foreign fighters are among Islamist militants killed in a southern Philippine city over the past days, officials say. 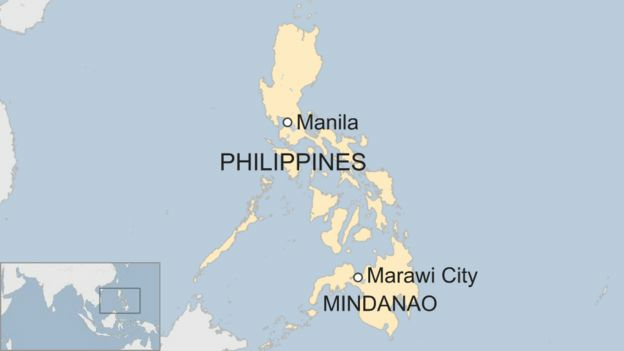 Six jihadists, including Indonesian and Malaysian citizens, were killed as the army continued its operation to drive the rebels out of the city of Marawi. Attack helicopters and special forces have been deployed in the offensive. It is a rare admission by the authorities that local jihadists are working with international groups. Marawi is a mainly Muslim city in Lanao del Sur province on the southern island of Mindanao. The province is a stronghold for the Maute group, which has pledged allegiance to so-called Islamic State (IS). What is happening in Marawi? Fighting erupted after a failed army raid to capture a top militant leader. At least 11 soldiers and 31 militants have been killed, a military spokesman said. Philippine President Rodrigo Duterte imposed martial law in Mindanao on Tuesday in response to the violence. Martial law allows the use of the military to enforce order and the detention of people without charge for long periods. Manila’s solicitor-general said that what used to be domestic rebels have now subscribed to the ideology of IS. “What is happening in Mindanao is no longer a rebellion of Filipino citizens. It has transmogrified into an invasion by foreign fighters,” Jose Calida told a news conference. The government had always downplayed the numbers of foreigners amongst the local fighters, Sidney Jones, director of the Institute for Policy Analysis of Conflict in Jakarta told the BBC. “And it’s crucial that the government acknowledges that there is a serious IS problem in the Philippines,” she says, explaining that a much better co-ordination between local and national authorities was needed to deal with the situation. 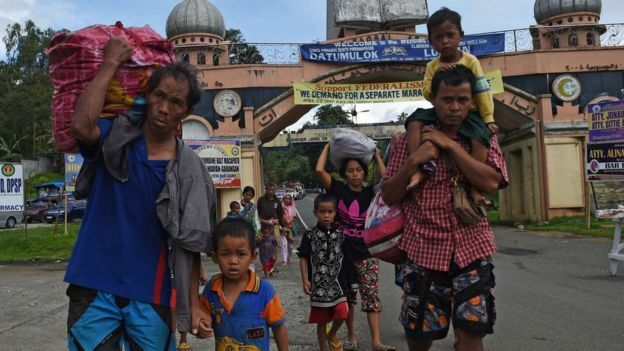 The admission confirms what observers see as moves by IS targeting the majority Muslim southern Philippines to establish a stronghold in South East Asia. “It is clear that the number of men from both Indonesia and Malaysia who have travelled to Mindanao has increased over the past year,” Ms Jones explains.